Yes, I know I promised to keep the summer colors alive and kicking- but I’m asking for a pass with this almost wintry shade because it’s from a summer box! 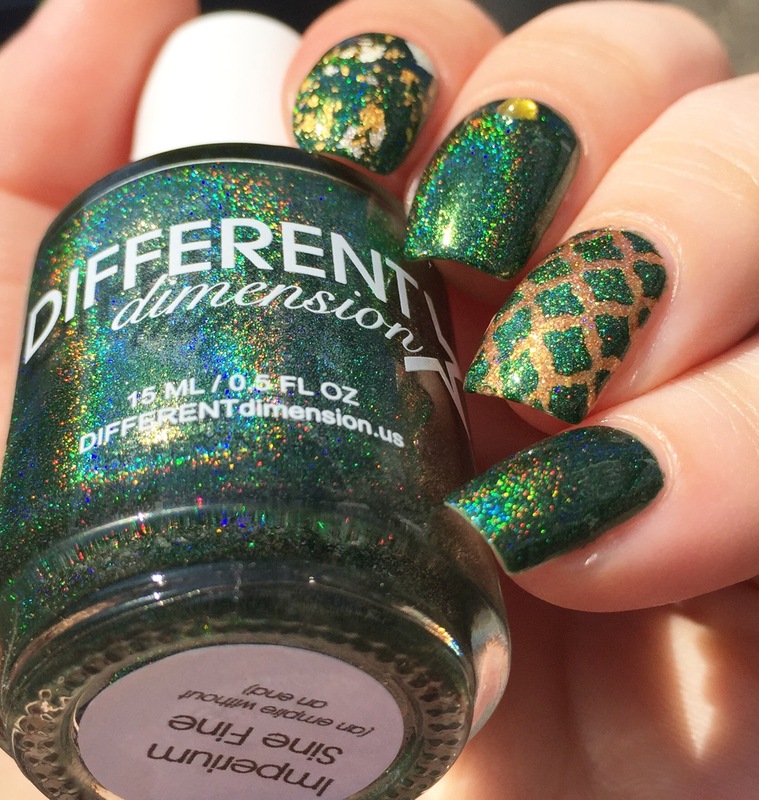 This is Imperium Sine Fine (or “empire without end” for the non-Latin folks), an evergreen holo from Different Dimension made exclusively for Llarowe’s “A Box, Indied.” August’s box was themed “all hail holos,” and I just couldn’t resist the Roman twist or the variety of holo shades. 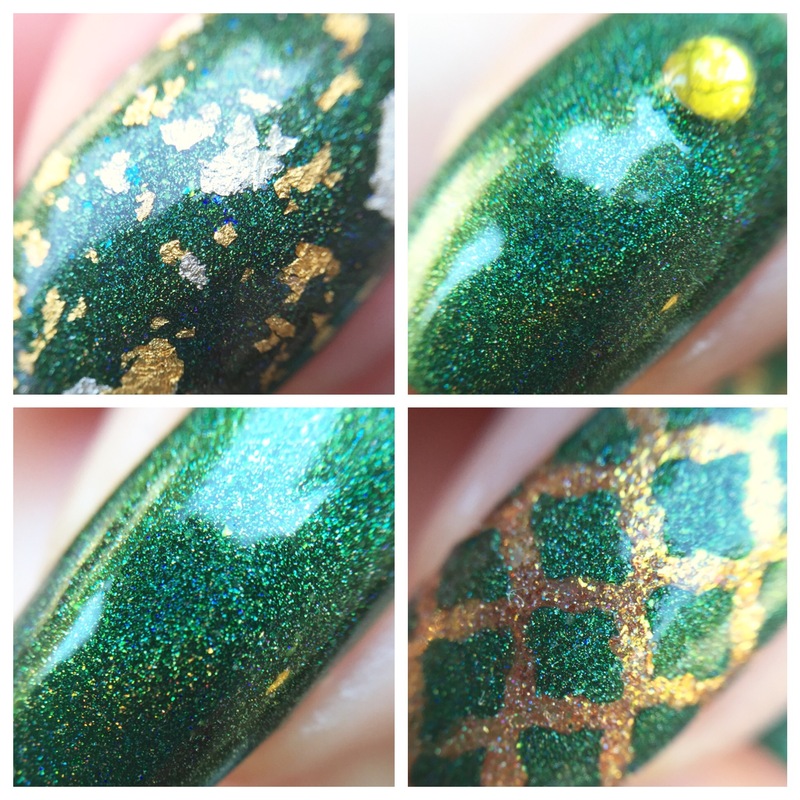 These first four photos are of Impirium Sine Fine in the shade. 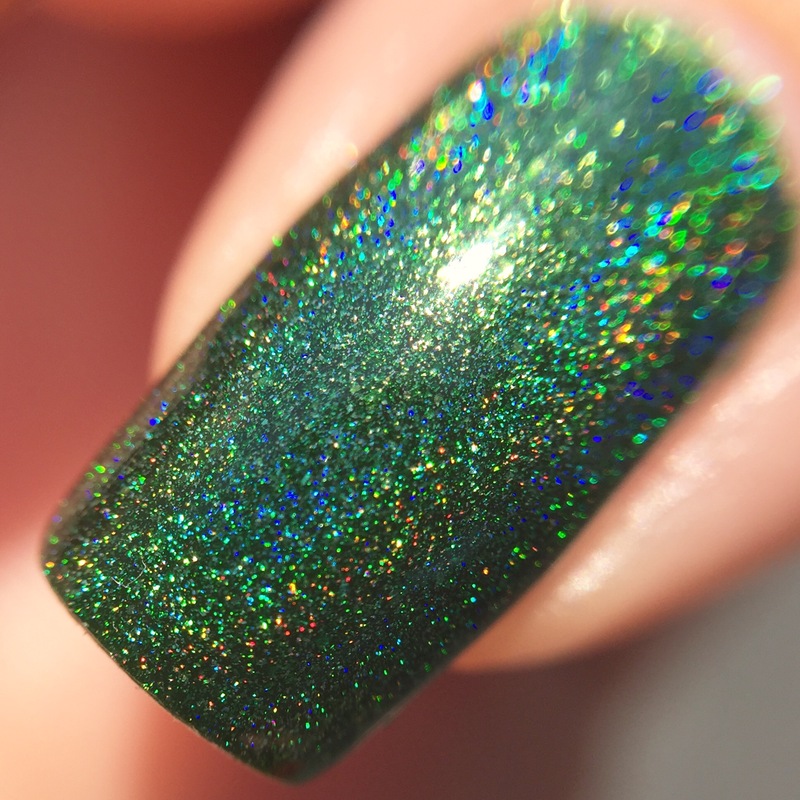 I love how it’s a medium linear holo, but there’s just a little bit of variation in particle size, so it really catches the light. 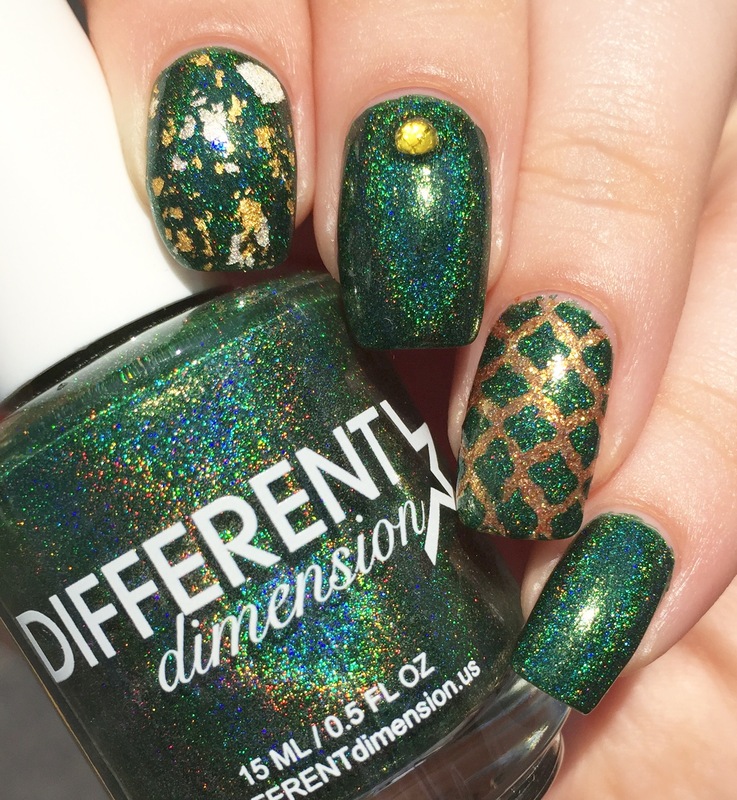 The undertone in this green is just a bit golden, which I’m hoping you can see in the pictures. 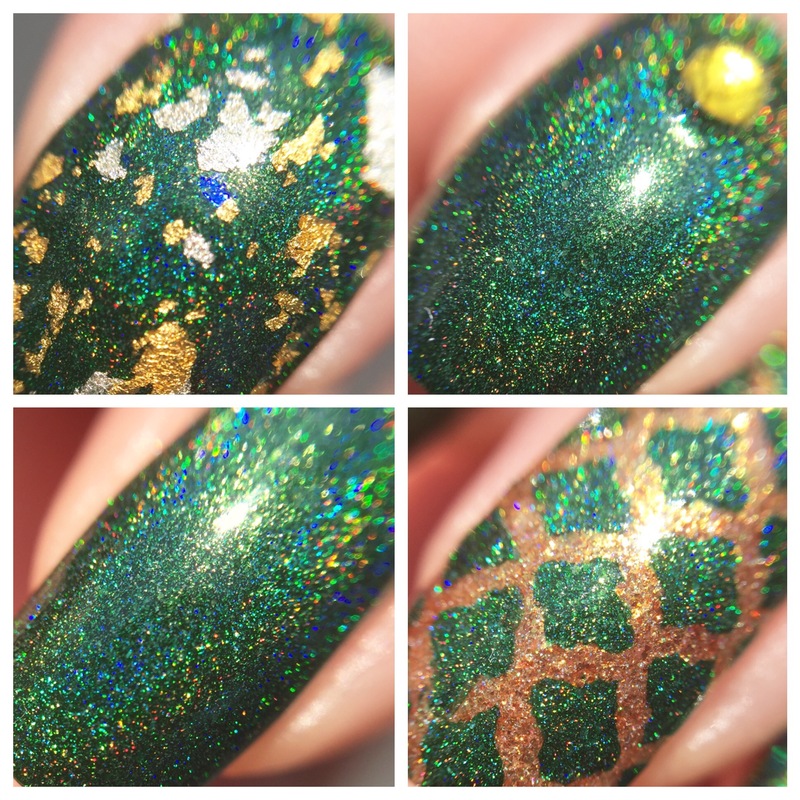 I think this kind of clear, gold/yellow-flash holo is really unique (especially for the summer)! The formula on this is fantastic. Nearly a one-coater for me. Here you’re looking at two thin coats. It was so smooth and easy to work with. Verdict: will wear again. 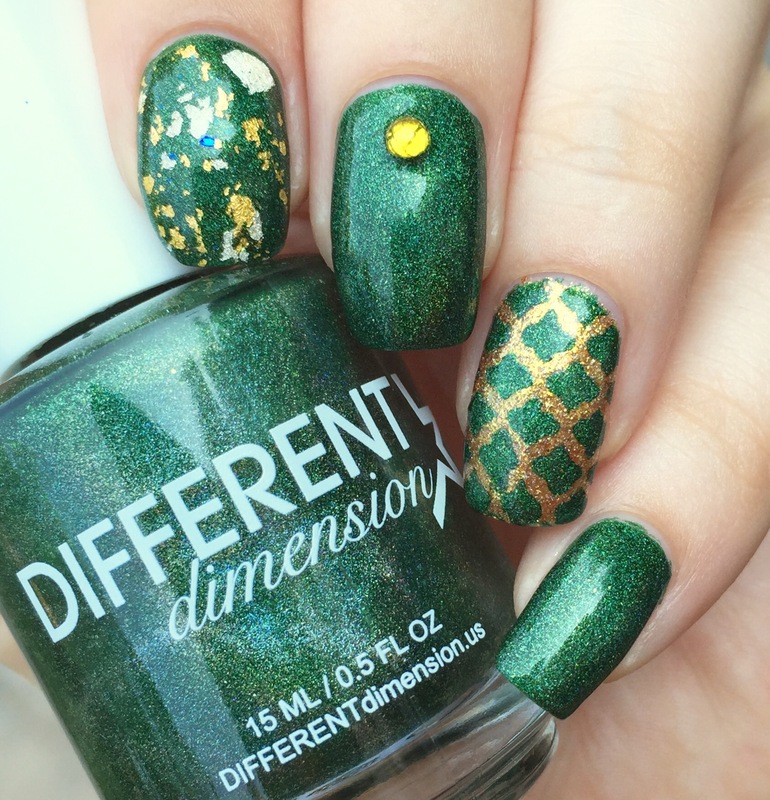 The gold undertone in the green made me go a little nuts with the nail art. I used WingDust “Gilty Pleasure” as a topper on my pointer finger. This might be my favorite topper ever (probably something to do with the real gold bits and blue iridescent flakes)- I use this whenever possible and then carefully guard it like I’m Smaug the rest of the time. 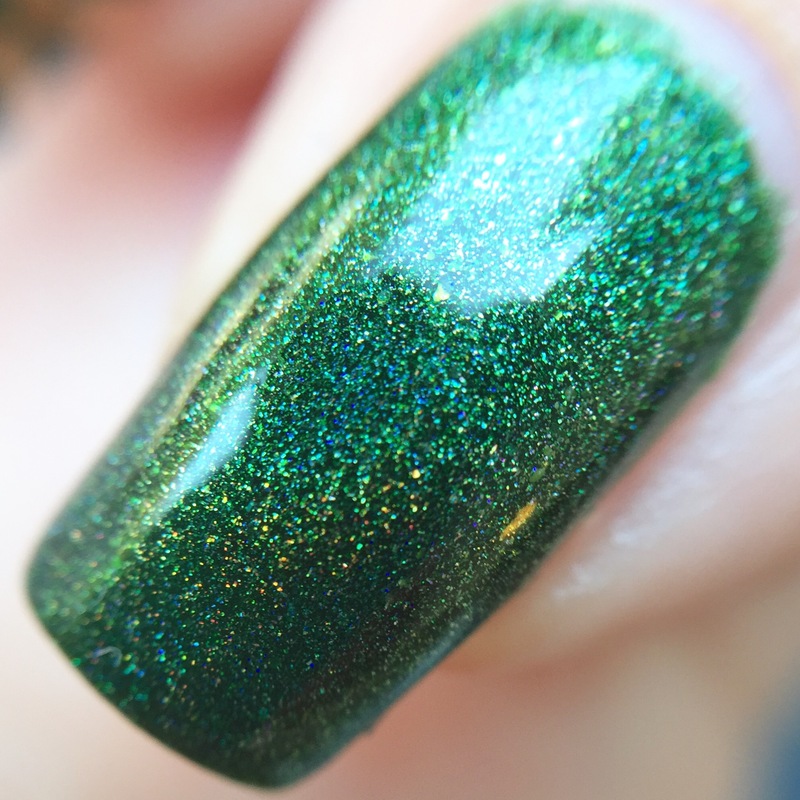 On my ring finger, I used Pahlish “Fields of Gold” (from another A Box, Indied; reviewed here) as a base. Then I sponged “Imperium Sine Fine” over Vibrant Vinyls’ quatrefoil stencils. 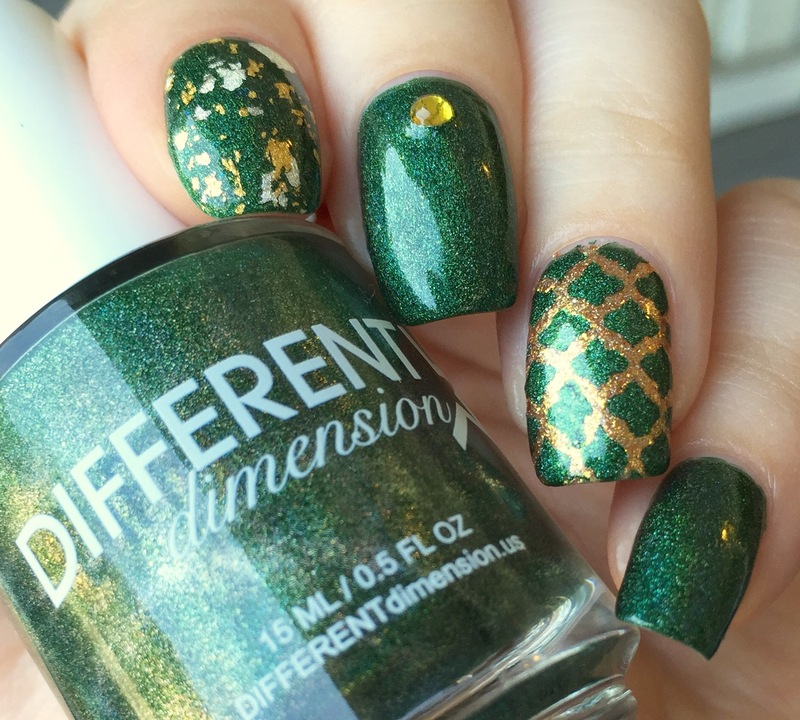 I’m loving wearing this nail art…but I feel more than a little Christmassy. Is anyone else getting that vibe? 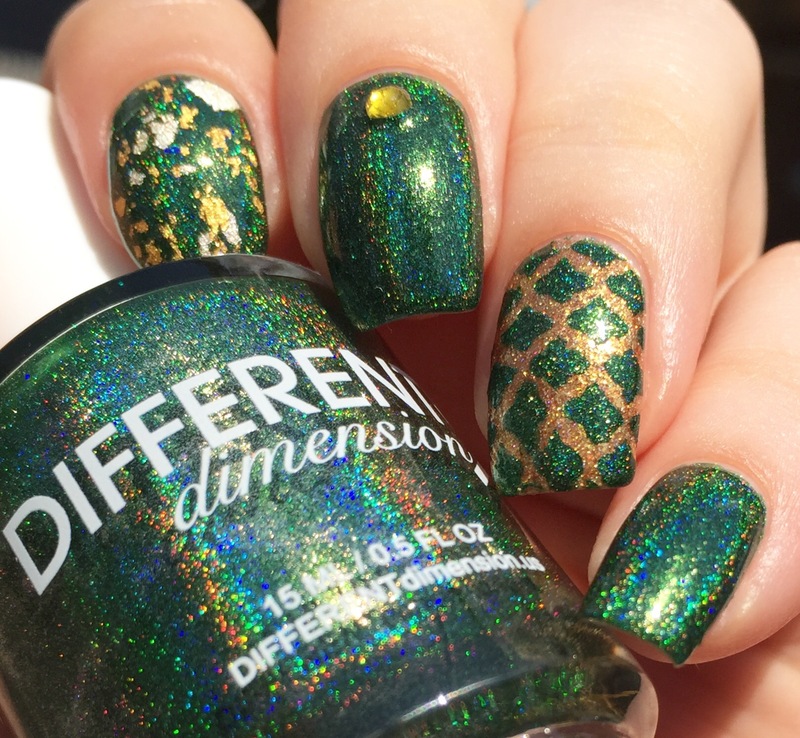 Maybe I’m just obsessed with Christmas and holiday-themed nail polish. Maybe I just need to slow my gold roll a lil’ bit. 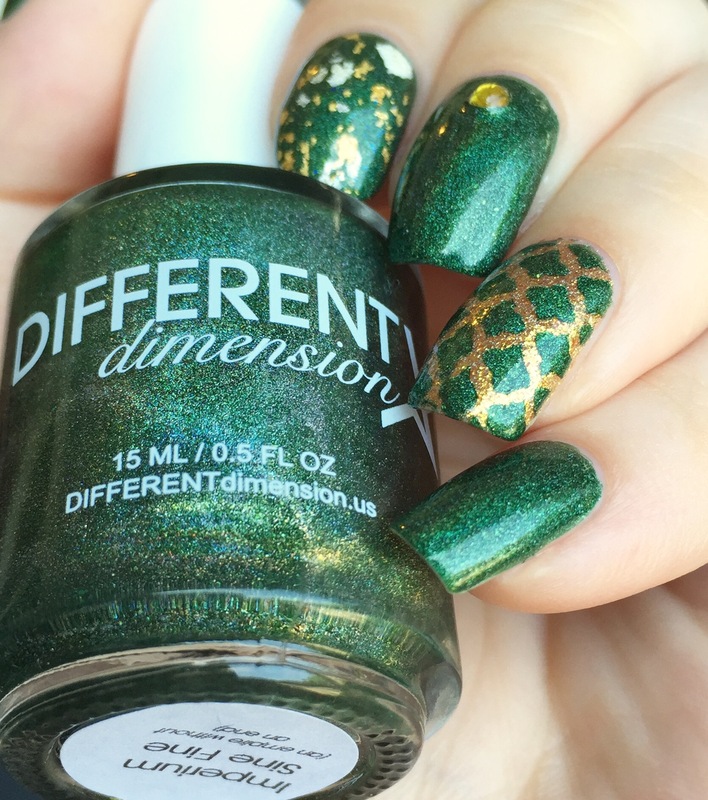 I’m really going to miss the Box, Indied (word on the street is that October will be the last box)- I’d love to hear recommendations for other indie polish boxes!